Compare Countertop Materials, Estimate Costs, Learn About Warranties, and More! At Express, we know how difficult it can be to choose a countertop material. That’s why we’ve created this guide to compare countertop materials for you! Each material is broken down to pros, cons, warranties, manufacturers and more. Don’t waste time searching around when everything you need to know is right here in our guide! If you’re planning to install new countertops in Maryland, this all-inclusive Countertop Buyer’s Guide can help you navigate the process. Our 14-page countertop buying guide is free, comprehensive, easy to use, and contains the industries best-kept secrets, so keep reading for a sneak peek at what you’ll learn. 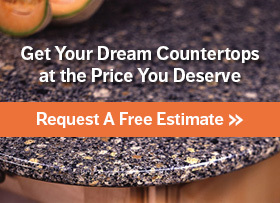 Ready to request a free quote from Express Countertops? Our experts are ready to answer all of your questions about our no-measuring required estimates and 7-Day Installation Guarantee! Just give us a call today at 888-675-9513 or click here to contact us online now! When you’re looking for new countertops, a lot goes into your decision. Features such as color, texture and heat resistance are important. At Express, we have gone further than that. Our countertop buying guide includes a full profile for every material, complete with manufacturers, price per square foot, cleaning and maintenance tips and much more. Homeowners often times fail to set a budget before shopping for countertops. Setting a budget first can help you get more for your money! We want to find you the perfect countertop that looks, feels and performs the best based on the budget you’re willing to spend. Use our guide to discover all of the add-on, installation and hidden costs of countertop materials, avoiding any surprises on your bill! Find the Perfect Material & Manufacturer for YOU! We really want to make it easy for you to find the perfect countertop material, so we broke down the pros and cons of every option while also comparing manufacturers in the process. Download this guide for our exclusive comparison chart the displays the qualities, price and even warranty of every countertop material! Get instant access to our Countertop Buying Guide!